Fastbackstack.com is having a huge 30% off eBay store wide parts sale starting July 4th through July 31st. The store will also be on Vacation mode meaning your parts would not be shipped until after July 20 but you can take advantage of a good deal. Parts for sale include 1964 – 1973 Mustang 1974 – 1978 Mustang II 1963 Fairlane 1966 – 1970 Ranchero 1970 – 1975 Maverick 1971 – 1973 Comet 1965 Comet 1964 – 1966 Falcon 1970 – 1971 Torino Ford F-100 F Series. 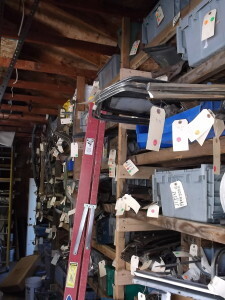 All Kinds of body parts, fenders, hoods, cut off sections, glass, wiring, trim moldings, brackets, panels, controls, heat and air conditioning, 9″ rear ends, 9″ 10″ 11″ drum brake parts, emergency brake arms, spreader bars, backing plates, disc brake spindles, rotors, hubs, Mustang II front suspension components, rack and pinion, drive shaft slip yoke, differential ring & pinion, Trac Lok Posi, Detroit locker, tail lights, tail light bezels, glove box, dashes, ash tray, consoles and more! It would be worth taking some time shopping and scrolling through pages of parts listings I will not be able to answer any questions until after the 20th of July. Autolite 1100 1V carburetors Was a good carburetor in its day. Used on Falcon Mustang Sprint Fairlane Comet 170 and 200 inline six cylinder engines. They are getting very hard to find and when you do find one only about 1 in 5 will function properly no matter who rebuilds or what they try to do to it. This is probably due to some internal wear issue that is un-restorable. Then a NEW one was reproduced but at a high cost. And even those re-production carbs had issues. About any carburetor can sit there and idle but other drive-ability issues are persistent. Starting in about 1967 Holley made a 1V to take the 1100 Autolites place. The replacement Holley is hard to come by but a far better carburetor. They swap directly in place with little to no modification needed. Nearly every time the Holley can be successfully overhauled with very few drive-ability issues. i.e surging galloping hesitation stalling backfiring running rich or lean icing up flooding etc.The Holley uses the same air cleaner as the autolite 1100. By about 1970 the Holley 1V was casted with the block letters AUTOLITE but is still the Holley style. And likely also used on the 250 cid 6 Cylinder. Will have a nice turnout of Shelby’s as well as every other type and year of Pony car. This year is the 50th anniversary of the Shelby and the 51st Birthday of the first Mustangs that rolled off the assembly line. The actual production started March 9th 1964 and the introduction of the American Icon Classic debuted at the Worlds Fair in New York on April 17 th 1964. That day Ford recorded 22,000 Units sales. Thats 22,000 mustangs selling in one Day. Back in the day. Shelby’s were Considered 1965 and were introduced in the fall of 64 all having Standard interior. As the Pony interior and GT package was not an option until April 1965. The Shelby’s did have the Handling package Consisting of a special Pitman arm and idler arm. These were longer than the stock ones to make Manual steering much easier and Quick ratio 16:1. The Special steering gear box tag showing the HCC AX part number. 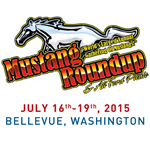 FastbackStack, LLC will be at the 2015 Mustang Roundup on Sunday, July 19th. Please come by and see us. 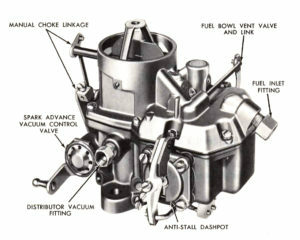 Ford made one of the best 4V carburetors when they developed the Autolite 4100 4bbl (4V carburetor). The Autolite 2100 2V was also one of the most trouble-free 2bbl carbs ever produced. In the early 1960’s the Autolite 1100 1V was used on the Ford Falcon and later on the 1964 ½ Mustang 170 cubic inch 6 Cylinder and the 200 as well. Autolite carburetors, when properly tuned, will out-perform most of the competition. In the 1956 and 1957 Ford Thunderbird performance category, the 312 V8 was outfitted with the Tri-power multi-carburation setup. This unit was a factory Intake manifold with Three Stromberg 2V carburetors. With proper linkage and adjustments, the T-Bird would take flight. Two of the rarest Autolite 4V’s were the 1.06 and 1.19 carburetor. These were used on the 1958 Mercury only. The Mercury Low Torque 383 V8 used the 1.06. The Mercury High Torque 383 used the 1.19 4V. This 1.19 Autolite carburetor has the highest CFM rating of any Autolite carburetor ever produced (it rates “669”). Later in 1962 and 1963, Ford developed the FE series 390 and 427 Tri-power and Dual Quad Induction system. 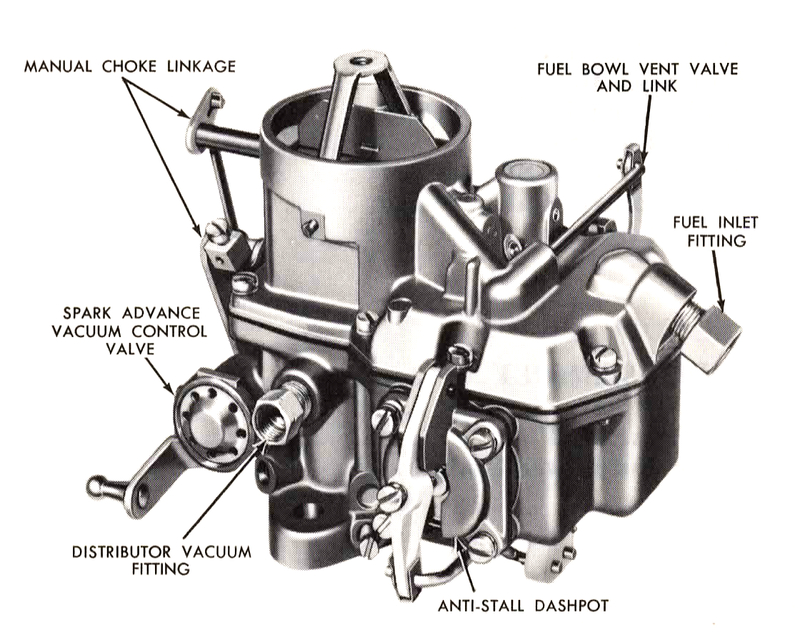 Ford utilized Holley carburetors for some of their high-performance applications. Standard and factory performance engines still commonly used the Autolite 1.08 and 1.12 venturi 4V units. In 1964, the 260 V8 was only offered with a 2V intake manifold. This Autolite 2100 2V carburetor was a 1.01 venturi. Other 2V carburetor sizes were .98, 1.02, 1.06, 1.08, 1.14, 1.23 and 1.33. Check out our Autolite carburetors we have listed in our eBay store. From 1962 to 1964 1/2, Ford used the 170 cubic inch 6 cylinder engine. This was an inline straight 6. The 170 engine was discontinued in the summer of 1964. The 200 engine was used until 1978, at which time it was discontinued as well. In 1965, Mustangs were outfitted with the 200 cubic inch 6 cylinder engine. At first glance, these engines look the same. There are some major differences, however. The main difference is a 170 engine block and crankshaft has four main bearing journals, while a 200 engine block and crankshaft has seven main bearing journals. Thus, the cranks and blocks are not interchangeable. A noticeable difference between the two engines is the 170 engine has three soft freeze plugs on the right hand side (passenger side) of the block, while a 200 engine has five soft freeze plugs. A subtle difference between the two engines is the timing cover. The 170 engine’s timing cover does not have a bolt hole in the bottom for an alternator or generator mounting bracket. The 200 engine’s timing cover has a bolt hole for mounting the alternator bracket. From 1962 to 1964 1/2, Ford used the 260 V8 engine. This engine was the predecessor to the 289. The 289 was developed in 1963. The main difference between a 260 and a 289 is the 260 has a 6 inch space between the motor mount bolt holes, while the 289 has a 7 inch space. All 260 engines have a 5-bolt bellhousing bolt pattern. The 1963 and 1964 1/2 289 engines have the same 5-bolt pattern. The 260 has a smaller cylinder bore. Ford did not make a 260 4V engine. You can always add an early 289 4V intake to your 260 engine if you want to make a “D code” style engine (“D code” is a 1964 1/2 289 4V engine).